By purchasing the new SENNEBOGEN 730 of the current E-series, the Pfeifer Group in the Bavarian town of Unterbernbach has shown its confidence in the latest generation of Pick&Carry material handlers. Here, the 730 will be used for any type of log handling. 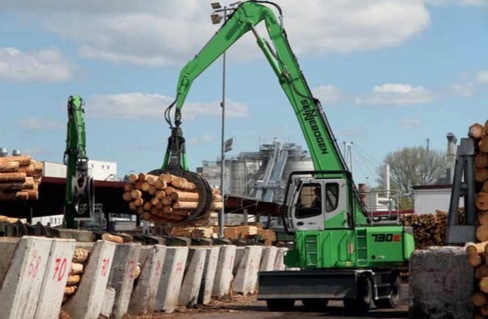 With its extended boom range and compact dimensions, the machine can show its full potential. With seven branches in three countries, the Pfeifer Group is not only one of the largest enterprises in the European timber industry, but also a company steeped in tradition. Since 1948, the company has been concentrating on the industrial processing of soft wood. At its location in the Bavarian town of Unterbernbach, Pfeifer produces 560,000m3 of sawn timber annually. In the log yard, most of the lumber is moved by green SENNEBOGEN material handlers. The latest addition is the brand-new SENNEBOGEN 730 material handler of the E-series. Operator Rupert Mahl has been operating the machine for some weeks now, and he is impressed by the ease of use and performance of the SENNEBOGEN 730. “During my shift, I travel about 30km along the lumber sorting lines. Thanks to the slewing uppercarriage, I can empty the boxes directly in the direction of travel, and manoeuvring between the log piles is easy.” The automatic detection of travel direction, which always allows forward travel independent of the uppercarriage’s slewing direction, is a great assistance. At the Pfeifer location in Unterbernbach, softwood lumber measuring between 3.60m and 5.10m in length and 900mm in diameter is processed. Using a 2.0m2 SENNEBOGEN log grapple, the logs are removed from the boxes and piled up to 10m high. The new piece of machinery is equipped with a 168kW diesel engine and all-wheel drive. When compared with other equipment designs such as the wheel loaders which had been used by Pfeifer until recently, the benefit of the Pick&Carry machines is obvious. Laborious manoeuvring is omitted, and the material stress but also allows a smaller counterweight to be used. Accordingly, the machine could be designed for compact dimensions, making it highly manoeuvrable. Its light weight requires less energy to accelerate and decelerate the machine, reducing fuel consumption. Operators benefit from an unobstructed view to the right-hand side of the cab. The elevated Maxcab is equipped with a sliding door and a camera system, allowing the operator to keep an eye on the entire surroundings of the machine. The massive base frame, the reinforced mobile undercarriage, the bump guard and the protective grid fully enclosing the cab ensure the safety of man and machine. Klaus Klemm is the Head of Maintenance at Pfeifer in Unterbernbach. The determining criteria for his decision to procure the latest generation of material handlers was based on the vehicle’s high degree of reliability and his excellent experience with existing machines. Last but not least, the ease of servicing and the well-arranged design of the green machine are a clear sign of quality that cannot be praised enough, according to Klemm. The machine is maintained by sales and service partner Fischer&Schweiger which is also responsible for servicing the other SENNEBOGEN material handlers at the site.